I am really loving the light mornings and evenings and the real sense that summer is on it’s way, definitely my time of the year! Please can it stay like this?! 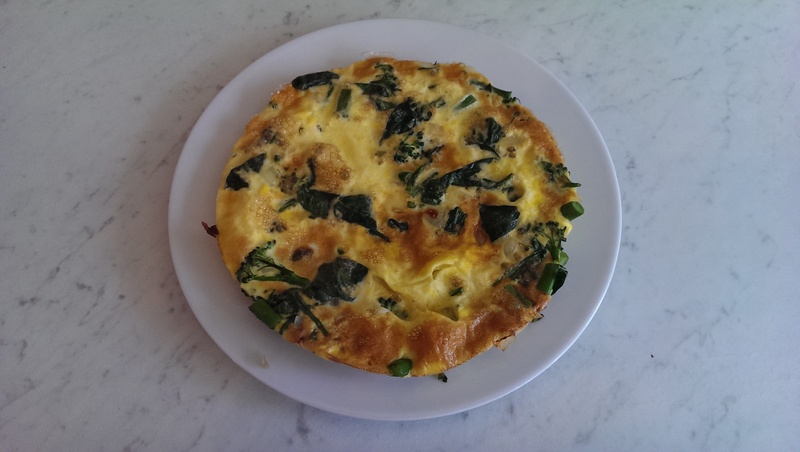 In my quest to keep my diet interesting, especially breakfast, I have been trying out a slightly different take on omelettes, the frittata. 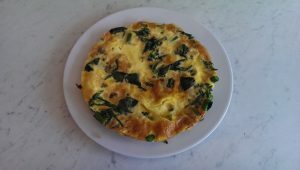 They are quick to prepare and cook, and taste truly scrummy (as well as being really good for you, but shhh don’t tell anyone)! Melt the butter in a pan and add the onion, cook until soft and then add the broccoli. After a few minutes add the spinach and wait for it to wilt down to nothing. Then whisk the eggs together and add to the other ingredients and cook on the hob until you can see the sides firming up and coming away from the pan. I then put it under the grill to cook the top or you can put it in the oven for 15 or so minutes if you have saucepans with handles that won’t melt! I have replaced the broccoli with asparagus and it worked really well so feel free to play with the ingredients! And making enough for 2 days means you can eat it cold the next day or even take it to work as a packed lunch. So enjoy mixing up breakfast and lunch and let me know how it goes, head over to my Facebook Page or follow me on Twitter.